In his third game as a starter, undrafted rookie LT George Rant made no errors vs. the Patriots. 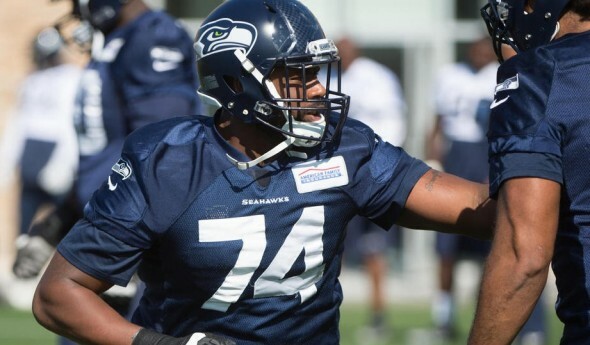 Now he looks like the permanent successor to Russell Okung. Only with the Seahawks . . .
By now, discerning fans know that the Seahawks have a reputation for drawing from the tired, the poor, the huddled masses yearning to be in the NFL, and finding quality players. Still, this is palm-t0-forehead stuff: According to Pete Carroll, undrafted rookie George Fant, the power forward turned starting left tackle, had no missed assignments Sunday against the Patriots, in the third start of his football life at any level, any position. Further, Fant basically has won the position, the second-most important job on the offense. Line coach Tom Cable said after practice that Bradley Sowell, the original starter who is returning from a sprained knee this week, is competing with incumbent Garry Gilliam at right tackle to start Sunday at the Clink against the 5-4 Philadelphia Eagles. From a standpoint of conventional football thinking, this is another Carroll moment of Looney Toonery. Fant was a three-time all-conference basketball player at Western Kentucky University in his hometown of Bowling Green, and had to be coaxed into taking seriously what NFL scouts were telling him. “Every other year we’d have a new football coach,” he said in the locker room Wednesday. “They’d always try to get me out to play. They’d joke around. I’d tell them don’t come around. I told them I was wasn’t playing football. After using up his hoops eligibility, Fant came back for a fifth year to learn this football thing. He had help from teammates, including Tyler Higbee, who’s a rookie backup tight end for the Los Angeles Rams. Fant played in two games, catching one pass on offense and making two tackles on defense. That’s it. Yet he was assignment-correct against the best team in football on the Sunday night national NFL game. Remarkable as was the firing Tuesday of leading rusher Christine Michael based in part on a breakout game from a rookie running back, astonishing is the word for the Seahawks finding a starting lineman at midseason from the blue-light table, and thinking he may be the long-term answer for one of the NFL’s best teams. “To me, the sky is the limit,” Cable said. “Everything about the offensive line is about growth and development. you’re trying to play well in November to get ready for December, and what’s next. After his pro day at WKU, Fant was no longer a secret, not after the 6-foot-5, 296-pounder — he played hoops at 250 — ran a 4.83-second 40-yard dash and had a vertical leap of 37 inches (for perspective, one of the great leapers in NBA history, former Sonic David Thompson, was called “Skywalker” for his 42-inch leap). But no one drafted Fant. They didn’t see the potential. Given how inept the line appeared Oct. 23 in the 6-6 tie with Arizona, Cable marveled how few errors the group had in Foxborough, when the Seahawks produced a season-high 420 yards of offense. “Cleaner,” he said. “I’m so excited about that word. As we head into the second half (of the season), we have a saying: ‘Let’s do our football right.’ It was clean for the first time — we read it right, we blocked it right, targeted some finishes. His teammates gradually learned of his no-football background during organized team activities and training camp. What went through your mind when you learned about Fant, Kam Chancellor? His adaptation started poorly with four penalties in the first half against New Orleans, his first start. Part of the learning curve. He said he lacked patience. He’s also about the only one in the room that isn’t amazed at his progress. If the Seahawks pull this one off, be warned: Never let Carroll or GM John Schneider near your garage sale. They’ll take spouse and the car and leave you with the crappy lawn furniture. I see this as much a lack of support for Gilliam as anything. I suspect Sowell is the best at LT but with Fant showing promise, best to get Sowell over to RT where we need the help. Hopefully Gilliam pulls it together. I think Gilliam needs his fire lit. Makes you wonder if Gilliam has dark thoughts about losing his job at center. Actually the whole O-line drama every year is about as unorthodox as I’ve ever seen. I’m sure there’s more to the constant creation of these individual in-house challenges than we know about . . .
I’d kinda like to see Big Walt working with Fant, teaching him how to play LT–might as well learn from one of the best to ever play the position. I suspect that might happen, but Jones’ style was unorthodox. Then again, Fant is a blank slate. What a story, and against the New England frigging Patriots no less. To take your garage sale analogy one step further, Pete and John might also recognize that $5 oil painting leaned up against the lawn furniture for the $20 million Van Gogh you didn’t no you had. Great writing as always, Art! Still early, but Fant will be the all-timer.